Was $125.95, NOW $89.95! 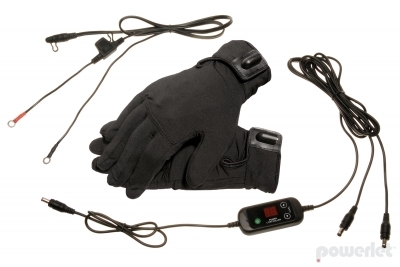 RapidFIRe™ Heated Glove Liner Kits are the surefire solution for cold hands. This package includes everything you need to hook up to your vehicle, Glove Liners, 5 Position Digital Controller, and Powerlet® Lanyard. Carbon Nanocore panels incorporated in these liners were designed specifically for the hands. Using Far Infrared Rays,a safe slice of the energy spectrum between visible light and microwaves, is harnessed to provide warmth that surrounds the hands. A Velcro closure keeps the glove securely in place and the warmth next to your hand. Independent third party testing has shown many times that these glove liners will keep your hands more comfortable than any other heated glove or glove liner. Powerlet offers the most complete, expertly engineered, interconnects and appliances. This enables our customers to enjoy a lifestyle utilizing convenient modern electronics. Powerlet uses the highest quality materials and craftsmanship. Our heated gloves are developed and tested in the USA by people who like to ride.